A certain amount of stress is good. 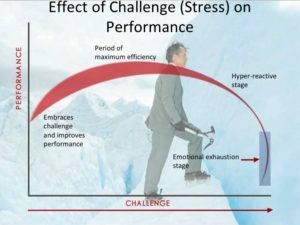 It helps “kick us into a higher gear” and helps us to reach our peak performance. It is a natural physiological response to a perceived threat. Note, the threat does not have to be real, just perceived to be real. Our typical response is one of the three f’s-flight, fight or freeze. Back in 2013, my wife Barbara and I attended a unique workshop on stress as part of the Annual Meeting of the American Board of Integrative Holistic Medicine (ABIHM)*. It was put on by Daniel Friedland, MD one of the foremost theorists on a workable clinical model of stress and stress control. He consolidated an 8 week course into 4 hours. At that time I thought that perhaps I could use his approach to get a handle on my years of chronic stress encountered in the Emergency Department. His approach included cognitive reframing of the fear or self-doubt that typically brings on the stress response in the first place. I found his techniques enlightening and useful going forward in understanding what really brings on stress. However, in my own case, this cognitive (cerebral) approach to stress resolution was not enough. Since that time I have discovered a whole new component of stress and the stress response that is deep, under the surface and often goes unrecognized. It is the response contributed by our primitive, reptilian brain. You see, we forget that we are mere animals with an enhanced cerebral cortex. We think that with our cerebral cortex we can think ourselves out of being stressed. It just doesn’t work out that way. Our physiology is such, that the flight, fight or freeze response to a perceived threat, i.e. stress, needs to involve our whole physiology in it’s resolution just like occurs in the rest of the animal kingdom. Because we tend to overthink using our cognitive powers, we become our own worst enemies in dealing with stress. This is how we develop PTSD (post traumatic stress disease). Peter A. Levine, PhD discovered this disconnect and in his book Waking the Tiger, he explained how important it is to tap into our own reptilian brain. We almost have to sneak up on it to resolve our chronic stress symptoms. Again, for certain forms of chronic stress, we must do more than identify our fear or self-doubt, and reframe it. We must tap into our primitive brains. Various new techniques are being used by stress therapists to do just that such as cognitive behavioral therapy, tapping, and others. While I have come to know a lot about stress, and how it contributes to all forms of psychosomatic disease, I am not a stress therapist. After an initial evaluation, if we think you would benefit from additional stress counseling and therapy, I will help connect you with a stress therapist who will work with you to tap into your primitive, reptilian brains and reprogram your stress response.